Qasr al Hosn is the symbolic birthplace of Abu Dhabi. It is the first permanent structure built in the Emirate of Abu Dhabi and one that housed its royal family, Al Nahyan, for generations. Qasr al Hosn began life in the 1760s as a coral and sea stone watchtower built by Sheikh Dhiyab Bin Isa, the Sheikh of the Bani Yas tribe. With its commanding position overlooking the sea, it controlled access to the island and protected the settlement that had grown around the water sources discovered on the island. With the watchtower in place, new settlements began to emerge and the community expanded. The Bani Yas tribe moved to the coast, and Sheikh Shakhbut Bin Dhiyab, who ruled Abu Dhabi from 1795-1816, transformed the watchtower into an impenetrable fort. The fort was made from coral and sea stones and covered with a render made from lime, local sand and crushed sea shells. Due to the shell’s reflective effect, the fort’s walls would sparkle in the sun offering a welcome coastal navigational tool for the region’s merchants. Mangrove was chosen to make the flooring and roof structure due to its natural strength and durability. Sheikh Tahoon Bin Shakhbut (1818-1833) enlarged the fort in the early 19th century and soon the small village of palm huts became a town of more than five thousand residents. In addition, Sheikh Saeed Bin Tahnoon (1845-1855) carried out further enlargements and improvements of the fort in the 1850s. After a period of hardship following the decline in the pearling industry, Qasr al Hosn went through a period of expansion during the exploration and discovery of oil between 1939 and the 1950s. 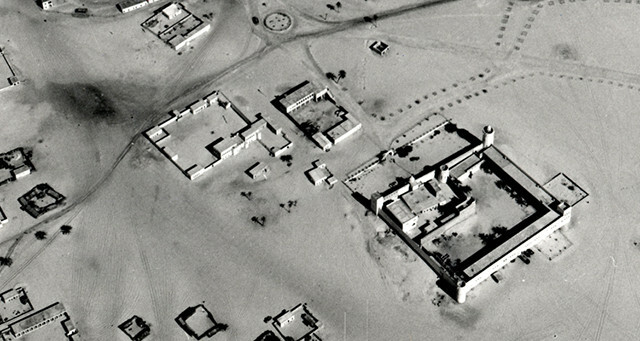 Sheikh Shakhbut Bin Sultan Al Nahyan (1928-1966) used oil revenues to build an iconic palace that enclosed the initial fort. The Father of the Nation, the late Sheikh Zayed Bin Sultan Al Nahyan, ordered a large scale renovation of Qasr al Hosn, transforming it from the royal residence into a museum and repository of collections relating to Abu Dhabi and the Gulf. Now, Qasr al Hosn is going through a new phase. Earlier this decade, it was discovered that the white render on the fort’s walls was causing corrosive moisture to be trapped on the original coral stone bricks. A project is underway to reveal once again the original brickwork and allow the structure to breathe.